On Tuesday, Sept. 10 at 2 p.m. 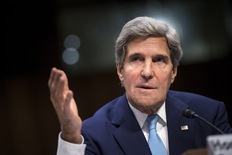 EDT., Secretary of State John Kerry will attend a Google + Hangout on Syria. New York Times columnist Nicholas Kristof will host the hangout, Syria: Weighing the U.S. Response, along with journalist Lara Setrakian. Kristof is asking readers, especially teachers and students to submit their questions about Syria in advance. H/T to Bridget Shirvell.